Wearing vintage pieces is a great way to add interest to your look. For dressy casual and cocktail attire, why not try a vintage shoe, like these from Daniel Green? (Back in the day, your mother or grandmother probably wore his gold, ivory or black leather wedge slippers around the house.) Both pairs are available on Etsy.com, a wonderful resource for vintage finds. The second pair (from Birmingham seller TwirlVintageCo.) reminds me of Cinderella’s slippers – so romantic. The use of PVC and lucite in shoes is a major trend right now (see Christian Louboutin’s ‘UnBout’), and these would perfectly complement a floor-length gown. 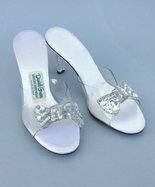 I love that they have a super cute, silver sequined bow accent at the toe for a touch of sparkle. These $42 mules have a 3 1/2 inch heel and are open-toed – meaning please skip the hosiery, and show off your pedicure instead! A word of caution: vintage shoe sizing is usually smaller than the modern foot. So before you purchase, please be sure to compare your shoe size against the shoe’s measurements to ensure a perfect fit. It would be a shame to purchase something fabulous that you can’t wear! Images via capricorne and TwirlVintageCo. Daniel Green back in the day? Every other year my grandmother and mom request Daniel Green slippers for Christmas. I know those shoes very well.